We have both dorm rooms and private rooms. We have 4 beds mixed dorm, 4 beds female dorms, 12 beds mixed dorm, 12 beds female dorms and private double room. We have comfortable social space on the ground floor where you can meet many people. 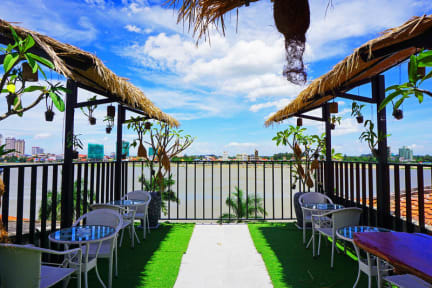 We are sure that all of our guests will enjoy great river view from our roof top. In the dorms, Every bed has a personal electronic socket and personal reading light. We also have an air conditioner and a personal locker in your dorm. The shared bathroom for the dorms are out side of the dorms so that you can sleep well without noise from the bathroom. We have a private bathroom in every private room. You can have breakfast from USD2 in the hostel. We have many services like laundry, towel rental, transportation, tour information and ticket service, etc. We want make your trip something greater, so please ask anything what you need to receptionists. Wonderful experience in Phnom Penh,would stay again.